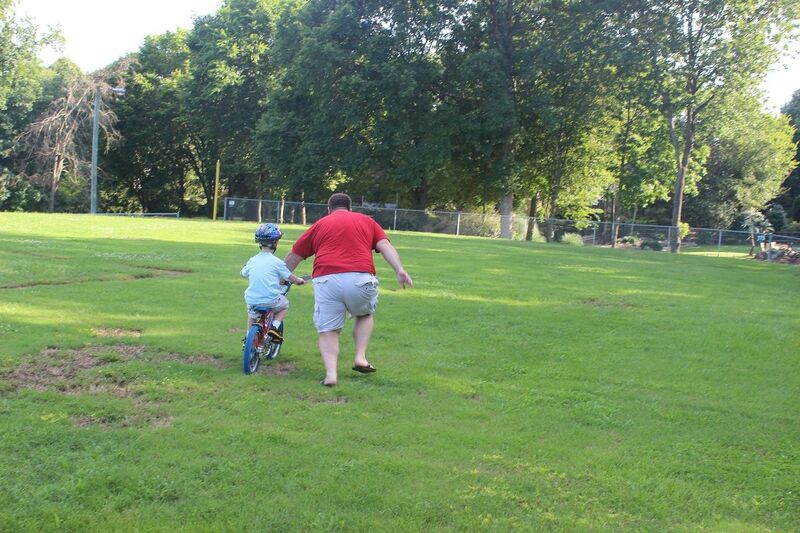 Our Sweet Love Story: Summer Fun #7 ~ Evan Learns to Ride! So this summer has been like the biggest summer of Evan's life for all the major accomplishments he has made! First, it was swimming. 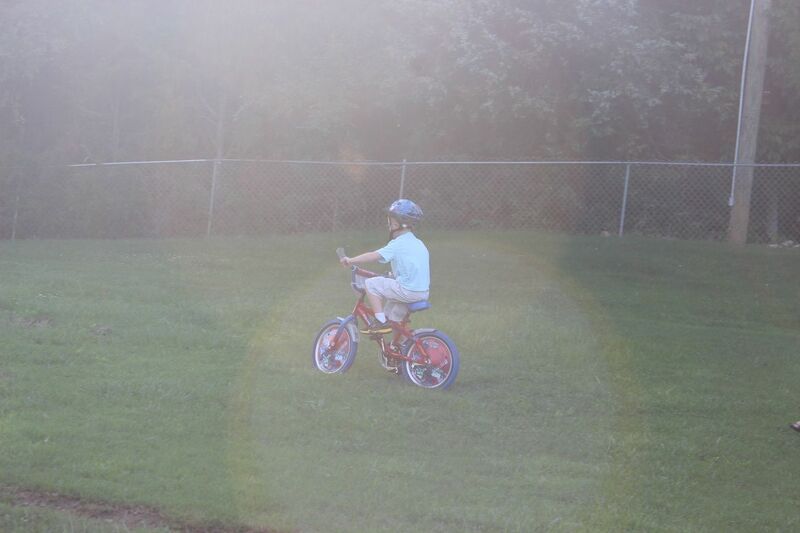 Then, he made major leaps in learning to ride his bike without training wheels. There will be more posts about the other major accomplishments in posts to come! 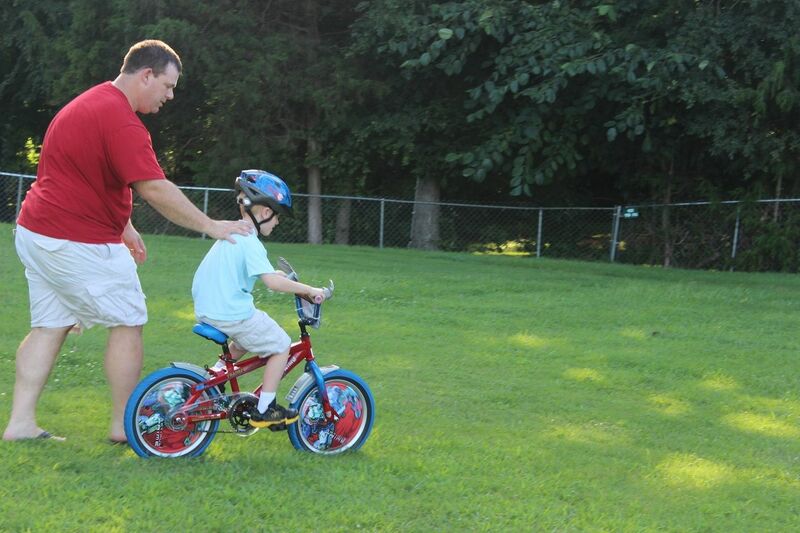 We knew that Evan just needed a lot of encouragement to start riding his bike without the training wheels, but he was scared to let go on his own on the pavement. We have a nice cul-de-sac across the road from our house. It is probably the best thing about this house's location. Our street is already pretty quiet and is just a short street tucked in the back of our neighborhood so not much through traffic anyway, but this little cul-de-sac isn't even part of a long street. It is just a circle attached to the side of the street our house sits on with 3 houses on it. We really just consider it our property because no one else really uses it. 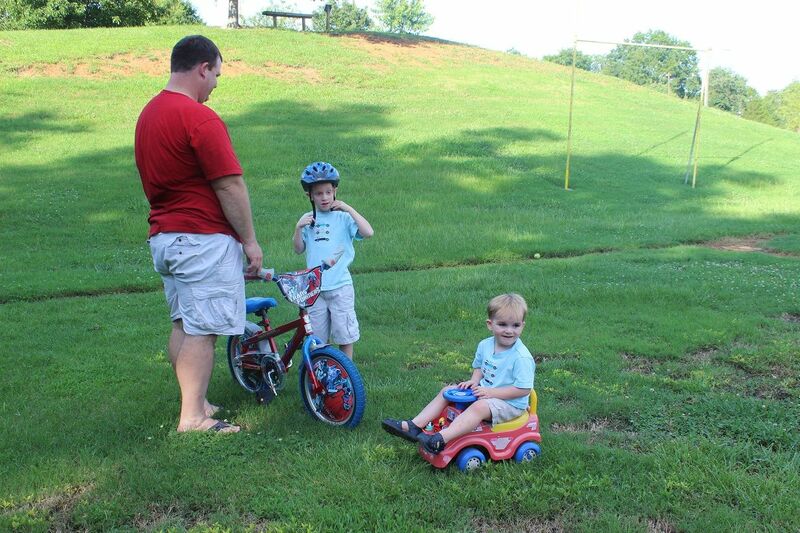 It has made a great place for the kids to ride their bikes, trikes, and scooters. 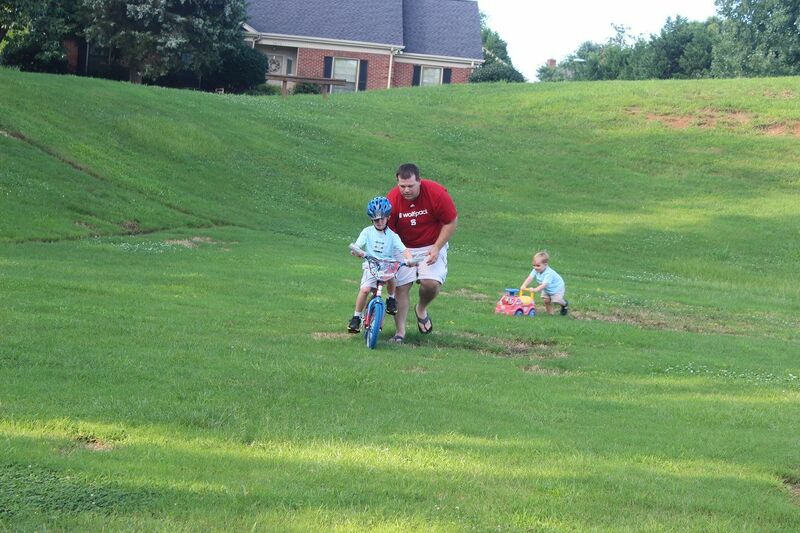 However, for this little bike training project, we opted for a grassy spot where falls would be less catastrophic. We decided to try a little softball field behind our neighborhood's community pool. 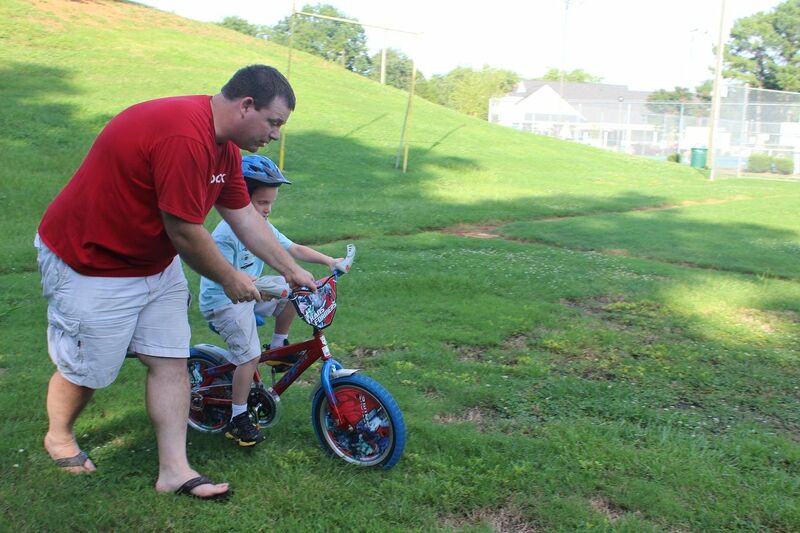 Eddie had the job of steadying the bike for Evan while I took pictures and kept Brody from running off and taking a swim in the community pond. 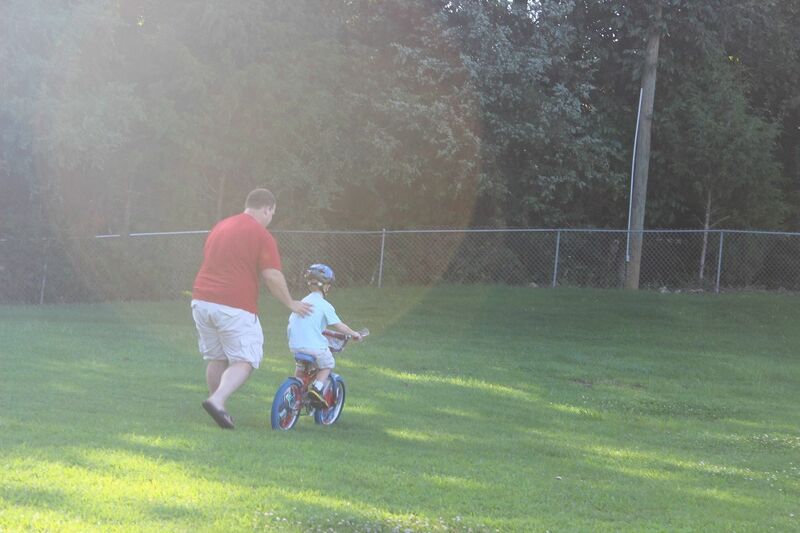 Evan quickly got the hang of it and made long strides without Daddy's assistance, and we know that with a little more practice, he'll be riding like a pro. Preparing to ride. Brody is ready to ride his firetruck too. 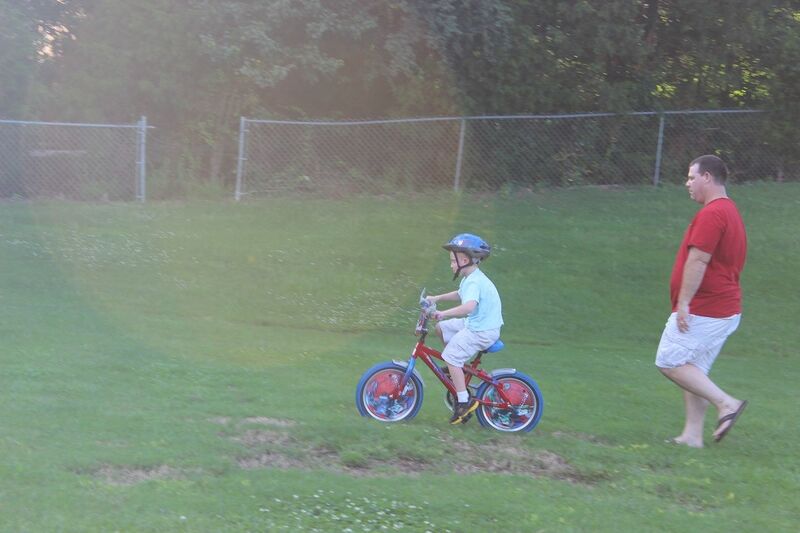 Learning to ride a bike is harder on the teachers than the students. Here they come...and here comes Brody. Daddy let go of the handle bar and just had his hand on his back. The glare from the afternoon sun was just awful! Almost ready to let go! Yay Evan! It really has been a big summer for accomplishments. I'm excited to know what else he has been up to. I'm jealous of all the green grass- you can tell how much rain you guys have been getting. Congrats Evan! You're growing so fast! Good job Evan! He's getting so big!!! Way to go Evan!!! That is a lot of major accomplishments this summer.